7 of the best products to see at the Bristol Show | What Hi-Fi? 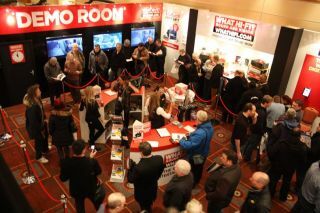 And, whether it's your first time at the show or you're a seasoned pro, there are always plenty of big brands launching new kit in the hallowed hotel rooms of the Marriott City Centre Hotel. And 2016 is no different. From headphones to turntables and everything in between, we've picked out seven of the best products you need to see (and hear) at the Bristol Show. Head to the Bristol Show website for more information and to book advance tickets - complete with a discount. And remember, if you can't make it to the show itself, we will be of course be on hand to bring you all the news, videos and pictures, right here on What Hi-Fi? A fresh B&W speaker range is always big news and you'll be able to see and hear the company's recently announced 800 Series Diamond speakers at this year's show. You'll find the entire line-up (comprising floorstanding, standmounter and centre speakers) in the Wallace Suite on the lower ground floor. DAVE (Digital to Analogue Veritas in Extremis) is Chord's latest DAC, digital preamp and headphone amp. It will play a key part in an all-British hi-fi system at the show, featuring Chord's most famous power amp, the SPM 1200 MkII and PMC's Twenty 26 loudspeakers. Drop by the hotel's Matthew Suite for a listen. We're used to testing ELAC speakers, but the company has thown a curveball for 2016 with its DS-101 Discovery. The Moon Neo ACE (A Complete Experience) combines an integrated amplifier with a hi-res streamer and DAC. The amp was handed a Stars of CES Award back in January and we're definitely keen to be reaquainted. Following on from its glowing five-star review, the Naim Mu-so Qb will be making its first public UK debut at the Bristol Show. If you want to see what all the fuss is about, you'll be able to experience the sister product to the original Naim Mu-so in the Brunel Suite on the Terrace Level. Sennheiser's making something of a comeback at Bristol. The company has been absent for the past couple of years, but in 2016, it returns with a brand new pair of headphones in tow. You'll be able to take the HD 800 S high-end over-ears for a spin if you drop by Bristol 10b on the ground floor. We wouldn't be surprised if people queue round the block to catch a glimpse of Technics' new SL-1200G turntable in the wild. We finally saw a finished model surface at CES 2016 and those of you keen to see what all the fuss is about can make a beeline for rooms 302 and 304 on the hotel's third floor.